24000 Features: -Play hair dryer with a working fan that blows air and makes sound.-Hair dryer requires two AAA batteries that are not included.-For ages 3 years and up. Includes: -Set includes13 accessories. Color/Finish: -Packaged in colorful corrugated carton with full color litho label. Assembly Instructions: -No assembly required. 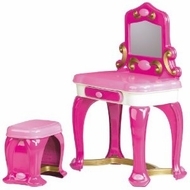 Dimensions: -Seat Dimensions: 12.38'' H x 11.88'' W x 9.88'' D.-Vanity Dimensions: 35.5'' H x 24'' W x 15.13'' D.
Vanity measures 24" x 15 1/8" x 35 1/2"